We recently reviewed these two short-throw projectors and found them to be very different on many levels. The Epson uses the same liquid crystal projection technology that has been around for almost three decades while the Ricoh embraces the new single-chip digital light processor ( DLP) found in today’s state of the art projection systems. 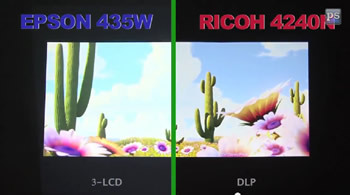 As a result, the Ricoh WX4240N bests the Epson 435W in almost every technical specification as the comparison below illustrates. More details about the two technologies can be found in the “Performance Testing” section below. The two projectors we tested are both similarly priced though the Ricoh WX4240N does include WIFI as a standard feature while the Epson 435W offers WIFI as an option for an additional $150. After un-boxing both projectors several differences become instantly apparent. Physically the Epson is bulkier and heavier which only matters if you plan to tote this regularly or pack it as a carry-on item. Another obvious difference is the placement of the ports and power supply. Ricoh has placed them all in the front of their projector while Epson has them all in the back. We didn’t consider this a big deal at first but after setting up we were impressed with how tidy the cables appeared on the Ricoh’s front ports and we really could not come up with a scenario where having the ports and power in the back would be useful. In fact we had to use longer cables on the Epson in order for them to reach around to the back on all setups. Though both projectors use similar inputs which include HDMI, two VGA ports, audio in and out, Ethernet, and USB, the Epson also has a 90s era RS-232 serial port for some reason, a 1/8” microphone input jack, and separate VGA out port. The Ricoh keeps things simple by using its second VGA port as its VGA out when needed. Both Epson and Ricoh include software for easy setup on any PC or MAC connected to the same network. This allows pass-through projection of the connected computer’s display to the projector. We found no issues with either company’s respective software but we did enjoy not having to use a network cable with the Ricoh in order to get high-speed WIFI connectivity. On both devices the projected image quality appeared better with direct HDMI or VGA input from the computer. There is some minor initial setup that is done through the on-screen menus of both machines, mainly to configure projection brightness, color temperature, focus, and zoom. The next major difference between the two is how they both handle “keystoning”. Keystoning is the process that reshapes a projector’s image with the goal of projecting a perfect rectangle onto the screen. Both units use digital keystoning which means neither uses optics to warp the projection but instead redraw the screen. However, the similarities end there. The Epson uses four buttons on the top of the projector to adjust keystoning up, down, left, and right, and does so in increments by pressing each button as desired until the screen looks straight. To assist with this, Epson offers a series of special setup screens that help show each corner of the projection and how it is positioned relative to the other corners. By comparison, the Ricoh projector, while also offering the ability to adjust keystoning manually, uses an internal accelerometer to determine its position relative to the ground and adjusts keystoning automatically without any user intervention. This function worked perfectly from any angle and greatly reduced setup time. It also contributed to the overall impression that the Ricoh projector is at least a technological generation ahead of the Epson. 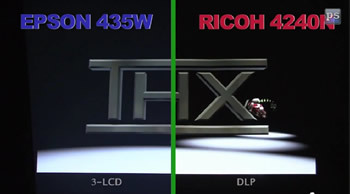 The image projection specs of both the Epson 435W and Ricoh WX4240N are basically on par with each other except for contrast ratio, and it’s a big one; especially if you’re trying to create a cinema quality experience. Ricoh has a 5000:1 contrast ratio versus Epson’s 3000:1, but the difference in actual use inside a darkened room appears magnified. As these screen captures illustrate, the Ricoh projector has much darker black areas while the Epson projector basically produces a medium-dark grey on a white screen. Even though both machines claim the same brightness at 3000lm, the Ricoh appears considerably brighter to the naked eye due to its inherently greater level of contrast. When we did our testing in a darkened room, we actually found the Ricoh projector to be too bright at its’ brightest setting so we left it in Standard mode. The Ricoh projector’s increased contrast translates to sharper and more readable text, crisp pixels on every part of its projected image, and overall more appealing and accurate colors. We had to make a number of adjustments on the Epson in order to obtain its’ best quality but we could never get it to look anywhere near as sharp, clear, or vivid as the Ricoh projector. The Ricoh WX4240N uses DLP technology to its fullest allowing this projector to consume less power while maintaining a brightness rating as high as the Epson 435W while generating considerably less heat. During operation over a twenty minute period, the Epson raised the temperature of its’ surrounding area by ten degrees while the Ricoh barely managed to increase its’ local area by a single degree. The DLP engine also contributes to the Ricoh’s overall lower power usage and smaller size. We actually found the Eco mode on the Ricoh to be more pleasing to the eyes while the Eco mode on the Epson appeared faded and washed out exacerbating the contrast issue. For a presentation, we can’t imagine anyone ever using the Epson in its’ Eco mode, so for practical purposes, the Ricoh projector uses approximately 20% less power and generates 90% less heat than the Epson projector. We also found the Epson to be louder as the fan seemed to need to work harder to keep the unit cool. This disparity in these two projector’s performance is a direct result of two very different technologies at work. Epson, renowned for its’ liquid crystal displays, continues to use technology developed in the 1990s for rear projection TVs which use a very bright HID lamp to project light through a “light engine” comprised of four prisms, three color filters, and three LCD panels in order to create its’ RGB image. This technology was widely used by Sony for its original WEGA line of TVs but was phased out in the late 2000s to make way for the much higher contrast LED/LCD combo screens so prevalent today. Ricoh on the other hand has decided to use essentially the same digital technology that brings you your favorite movies at your local cinema known as digital light processing or DLP. Without getting overly technical, DLP uses over a million nano-sized mirrors on a chip to reflect light through a projector resulting in more clarity and much higher contrast. Initially developed by Texas Instruments, DLP is the technology behind everything from hand-held LED and laser-driven “PICO” projectors to IMAX 3D HD cinema projection systems. DLP is particularly well suited for 3D and, though you may not come up with an application for it right now, the Ricoh projector does have 3D projection capability already built in as well. We can only speculate that at some point in the future Epson will eventually get on the DLP bandwagon but for now the Ricoh projector clearly has the upper hand.